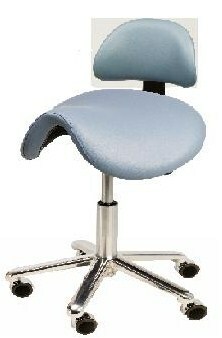 Not too long ago, we were contacted by a dental hygienist interested in all of the benefits of our Björn Saddle Stool (ideal in a tight workspace, positioning her nearer to the patient in order to work with arms closer to the torso, automatically seating her in a correct posture, etc) but concerned that the lack of a back rest on our standard Björn saddle stools might aggravate her pre-existing back and shoulder injury. As an experiment, we agreed to custom fit a high-quality backrest from our Bruno Ergonomic Chair to her Björn Saddle stool and a new offering was born: The Björn Series 700 SUPREME Saddle Stool with Backrest. In this client’s interesting hybrid product, the seat and backrest are mounted on a heavy duty mechanism with individual pneumatic or “gas spring” cylinders for independent control. The mechanism’s unique design allows her a range of movement while the backrest maintains constant contact and support of her back. With the control lever in the free-float position, the seat and backrest follow her movements. Just one lever controls all the adjustments of her stool – seat height, seat and backrest angle, and the free-float feature. She can avoid lumbar discs being strained or damaged over time from sitting in a traditional chair by sitting equestrian-style in the saddle stool, alleviating fatigue and avoiding possible injury while performing long procedures, all while enjoying the added comfort of her backrest. In a follow-up with this customer, she reported total satisfaction with her Björn Series 700 SUPREME, even going as far as saying she “could not live without it”! We are always happy to listen to our customers and to advise them on what seating solutions we think would make the most sense for them based on their unique needs. We invite you to call our team at any time, Toll Free at 1-888-245-1367. Like most of our clients, we at Scandex are concerned not only with quality and comfort, but also with the environment that we live in. In July, we announced our decision to make Ultraleather® “the vinyl style seating cover of choice” for our saddlestools and chairs. For over 20 years, Ultrafabrics, LLC (the manufacturers of the Ultraleather® product) has offered environmentally conscious products concerned with the long-term impact on the environment. With the breathable, PVC free, and low VOC performance attributes of Ultrafabrics’ products, coupled with efficient manufacturing processes that are based on conservation of raw materials, toxic-free solutions, and minimal dependency on natural resources, we feel proud to offer these exceptional products to our discerning customers, and confident with their quality. Durability is Sustainability. The less to replace, the less there is to waste! Scandex is announcing our decision to make Ultraleather® by Ultrafabrics, LLC the standard vinyl style material for our Bjorn Saddle Stools and Bruno Ergonomic Office Chairs. We have offered this product option for the past few years, but have now decided to make it the standard vinyl style seat covering because of it superior durability, exceptional comfort, and Ultrafabrics, LLC’s commitment to environmental sustainability. Our clients in the dental, medical and veterinary professions find that Ultraleather™ is an excellent choice for ease of care, cleaning and disinfecting. We of course still recommend our leather and fabric upholstery for the positive qualities that they have to offer. For any questions that you might have about the benefits of this upholstery choice or its suitability for your use, please contact us at info@scandex.us or give us a call at 888-245-1367. Sitting smart – and “Standing up for yourself” as well! The article below appeared in the Boston Globe this week. While our neighbor, Mr. Carlo Rotello (director of American studies at Boston College here in Newton, MA), correctly points out that it is good to take breaks from sitting as well as to try to do more activities while standing, there is also a happy “middle ground” option – might we suggest the Bjorn Saddle Stool? Sitting on the Björn Ergonomic Saddle Stool with your legs at approximately a 45-degree angle automatically positions the body in a posture-perfect manner (holding the spine in its natural S-curve), even without a back support. It is ideal for many home, office, dental/medical and other uses and has many size, color and arm support options. Read more about the health benefits of the Bjorn here. I’M WRITING this column while standing, which may seem like a trivial change from the norm, but it makes a world of difference. Once you become aware of just how much you sit, just how completely the design of our environment enforces the expectation that you will sit, it’s hard not to see our culture as a chair manufacturers’ conspiracy. In school, at the office, in cars, when we eat or use computers or watch TV, we sit, sit, sit, sit. Sometimes you have no choice. You can’t do anything else in a car; if you get up and walk around at the wrong time in school, you’ll end up in the principal’s office; and if you do it on an airplane you’ll get sent to Homeland Security’s equivalent. But even when we do have a choice, we usually do what’s expected of us and take a seat. When was the last time you stood up to watch TV alone at home? I don’t commute by car, and I’m a little weird in choosing to stand on the T, in airports, and in waiting rooms (which leads to receptionists asking repeatedly if they can help me), but, still, like a lot of people who work in an office or at home, on a typical work day I nail myself to a desk chair first thing in the morning, move to a different chair for lunch, then nail myself to the desk chair again for the rest of the day. I may take a break for a run at some point, and I leave the chair for a few hours in the evening to hang out with my kids, but I return to it for one more extended session before bed. I know there are studies that show exactly how bad so much sitting is for me — and that they show that even regular strenuous exercise won’t cancel the effects of too much sitting, and that the consequences extend deep into debates about health care costs and obesity. But I don’t really need the scientific support to be persuaded that all this sitting is killing me. It feels as if my spine’s going soft and toxins are pooling in the middle of my body and gradually poisoning me. Self-defense is in order. Steps at the margins are relatively easy to take. I started walking the kids to school instead of putting them on the bus, and I walk to and from work if I have time. I look for excuses to get up during the day — for instance, instead of Googling the quotation from Dr. Seuss that serves as my epigraph, I went upstairs and found the book. And I just found out about the fad for “walking meetings,’’ which strikes me as a great idea, especially if it leads to fewer and shorter meetings. But that still leaves the bulk of the day, which I spend writing or reading on a laptop. The remedy is to either lie down or stand for significant periods. Lying down has at least one major drawback: unplanned napping. So that leaves a standing work station as the obvious option. I just started using one a couple of days ago, alternating between it and a regular desk as I get used to the increase in standing time. Despite the ache in my feet (temporary, I hope), it feels so good not to sit while I work that I fear I’m about to turn into the worst kind of zealot convert. I realize that the mediascape is awash in preachment from such types, and I don’t want to be yet another columnist telling everybody how to be as healthy and ergonomically well-adjusted as the columnist is. So let’s leave it at this: I was dying a slow death from sitting, and standing up is making me feel a lot better. Carlo Rotella is director of American studies at Boston College. His column appears regularly in the Globe. Scandex is the top of the mind choice for veterinarians the world over. Vet practitioners who require superb back/lumbar support to help minimize lower back problems and reduce the potential for musculoskeletal disorders turn to Scandex. Veterinary professionals will be “sitting pretty” in Scandex Swedish ergonomic chairs and stools, which are designed for correct seating so the lumbar area is supported and the spine maintains the proper “S” position. The most popular office staff seating is the Bruno Ergonomic Office Chair Series 300. The Björn Ergonomic Saddle Stool Series 400/600 helps to alleviate fatigue from standing for long periods at the examining/treatment table, thanks to positioning a veterinarian or technician closer to an animal which reduces overall strain on the back, shoulders and neck muscles. This type of upright, seated support is particularly helpful during surgical procedures. The Björn Ergonomic Saddle Stool may be adjusted to proper height and tilt. Sitting on the Björn Swedish Ergonomic Saddle Stool with the angle between the torso and the legs (thigh portion) at 135 degrees (a 45-degree angle to the floor) automatically positions the body in a posture-perfect manner, even without a back support. “Prolonged static, awkward positions are the most critical risk factor for causing debilitating back, shoulder and neck pain,” explained Sven Emilsson, Director of Sales at Scandex. Scandex recently launched the second generation of their website, www.scandex.us which provides veterinary practitioners with a Selection Guide that provides guidelines for utilization of Scandex’s Swedish ergonomic chairs and stools in various settings. Scandex sales representatives are happy to help to “build a chair or stool to preference. Veterinarians may also take advantage of Scandex’ special “Rent-A-Chair” option. To speak with a Veterinary Division sales representative contact 1-888-245-1367 or visit www.scandex.us. Designed to help minimize lower back problems and reduce the potential for musculoskeletal disorders, Scandex Series 600 Björn Swedish Ergonomic Saddle Stool has been adapted specifically for the male user to remove pressure on the prostate. Reduced tension and pain in the back, neck and shoulders,due to sitting with the spine in its natural neutral S-curve. Improvement in respiration as the seated posture on a Björn Swedish Ergonomic Saddle Stool allows for deeper, easier breathing. Scandex recently launched the second generation of their website, www.scandex.us which provides a comprehensive Selection Guide with guidelines for utilization of Scandex’s Swedish ergonomic chairs and stools in various settings. Individual sections on the website for types of arm supports, upholstery, cleaning and care allow consumers to “build” their own chair to preference.